SamTrans Offers Assistance in Bay Area Tragedies: – Peninsula Moves! 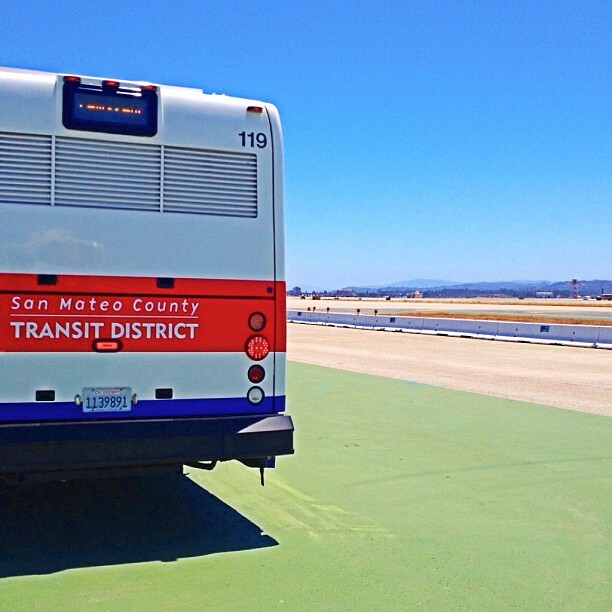 SamTrans buses wait instruction on the tarmac after responding to the July 6 Asiana Airlines crash. Photo by Instagram user @transitmonkee. In the wake of two tragic events in the Bay Area last weekend, SamTrans stepped up to provide emergency mutual aid services to support first-responders in rescue efforts and transport passengers in critical need of care. Just before 11:30 a.m. on July 6, Asiana Airlines Flight 214 crashed while landing at San Francisco International Airport, killing two passengers and injuring 168 others. As the plane was engulfed in flames, SamTrans quickly dispatched two buses to the staging area for assistance. One of the buses remained on site during the entirety of the rescue effort, while the other transported 17 people to Stanford Hospital. Of those transported, 11 were passengers aboard the flight. The remaining six were medical personnel. A little more than 14 hours later, SamTrans vehicles were responding to another critical scene, this time aiding firefighters battling a six-alarm blaze at a Redwood City apartment complex. At 3 a.m. SamTrans dispatched a bus operated by contractor MV Transportation to the site of the fire. At about 3:45 a.m., that bus shuttled 80 residents to the Fair Oaks Community Center, where they were able to rest and recover following the traumatic event. Later that day, SamTrans dispatched a second bus to the community center. That service vehicle took 27 of the displaced residents to a temporary housing facility on Valota Road in Redwood City. The fire at the apartment complex injured 17 people, including three firefighters. One person has been confirmed dead from the blaze and 97 people were displaced. The cause of the fire is still under investigation.